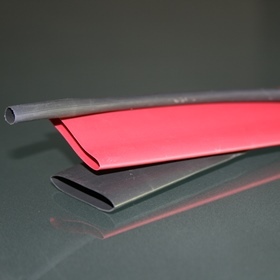 Three varieties of heatshrink tubing are currently available, namely SCG (thin wall tubing), RDW (dual wall tubing) and RMW (medium wall tubing). Electrical insulation and protection of in-line components, terminals and splices. Bundling of wires and colour coding of cables, terminals and components. Strain relief for electrical wire connections for long term reliability. RDW environmentally seals and protects interconnections in a wide variety of electrical and power distribution applications, including wire splices, breakout and connector-to-cable transitions. The products high shrink ratio makes it possible to repair most damaged cable jackets without removing connectors. It is highly suitable for marine, commercial, avionics and power generation and distribution industries. 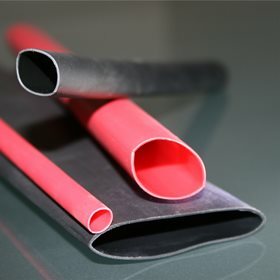 RMW is a medium wall cross-linked polyolefin heatshrink tubing ideal for use in ariel, underground and direct installations. The RMW range is most suitable for installations that require tough, lightweight and flexible insulation. 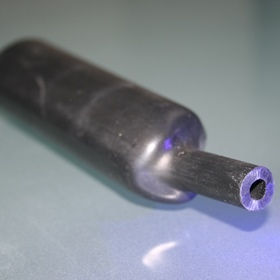 The tubing has a hot melt adhesive which melts as the tube is shrunk and creates a strong bond between the jacket and the tube. This provides suitable applications for waterproof jointing and sealing cable terminations.